Project 1 Photography – art or science? Creative Arts Today has been my first course with OCA and certainly has not been easy for the very wide range of subjects to investigate and even more than that for the great effort it implies to develop an awareness of the ways in which all these cultural disciplines are strongly interconnected and not forget the common cultural ‘broth’ when studying them specifically. The accent on the cross-disciplinary nature of culture and the invitation to test it by exploring how the same themes, in this case time and place, have been dealt with in different areas have been for me definitely the most fundamental and precious outcome of this first course and shall be my ‘fil rouge’ in future studies. So I am very happy to have started my learning journey with OCA from here even if it has been difficult. Two other basic aspects that this course has helped me to focus on are the importance of theme on one side and of communication on the other and also their mutual dependence: to communicate effectively is possible only if the message is adequately expressed and this applies to all creative disciplines. The artist, the writer, the visual communicator, the photographer or the designer, all need to convey their vision if there has to be an exchange with the audience or the public. In this respect my ‘discovery’ of the reader-response theory in Part 2 has been really inspiring and has triggered several lines of considerations as I explain in my conclusion to Creative Reading. But this is not all: the theoretical aspects covered by this course are another very strong feature and a good reason to tackle it before engaging into specific areas of study. Creative Arts Today has offered me a chance to come to grips or at least get the first notions of fundamental thought movements – modernism/postmodernism, structuralism/poststructuralism etc – that are at the heart of contemporary culture. On a practical note I am also very happy of my decision of keeping a public learning blog at the beginning of the course: this has helped me a lot to organize my work, make useful cross-references that I shall be able to use also in the future and keep a good pace. What I shall try to do is add also personal research, details of exhibitions, books read and so on. I have not done so in this blog and my tutor suggested me that this would be a good idea even if it implies more work. Another area that I shall try to develop is critical thinking: I have been a bit ‘shy’ during this course since as a student I felt that I was not entitled to question what I was reading, but I am beginning to see that to ask oneself questions is a fundamental part of the learning process and is also very useful for self-assessment. My next course will be Sculpture 1: Starting out in 3D and I am sure that what I have learnt so far will be valuable. Many concepts that I am researching for this new course are familiar now, but what I especially notice is that my level of awareness and attention and my capacity of establishing connections have much improved. It remains to be seen if and how I shall be able to feed all this in my burgeoning creative process. It shall be another voyage of discovery, I am sure. My first, hasty thought after a quick reading of Prof. Rose’s feedback has been that my essay was in many ways ‘wrong’ and that I needed to rework it substantially, so I was initially discouraged even if my tutor’s overall comment was positive. However, when I reread it carefully I started to see things differently and the feedback got really rich: the observations and suggestions were certainly meant to be useful pointers on how to make improvements in some places of the essay at hand and give me additional information on aspects and issues that I might not be aware of, but also offered important criteria for tackling essay writing at large. I shall now try to summarise the main ‘lessons’ I got from this feedback (I put my tutor’s words in inverted commas). I should be precise and consider carefully what I write, also implicitly: if I say for instance that the works were also exhibited in their entirety ‘is it the case that they are ever displayed singly’? Here an innocent little word like also does create misunderstandings. Try not to be vague, go into details, go below the surface: if I say that the works belong to the landscape from which they came this is true ‘in a way, but also think about the artist’s intervention’. (Following from the above) Do ask myself questions about aspects of work mentioned, probe them further: in this case the relevance given to process in these artworks, their ‘history’, the act of repetition, the concept of ‘nature’. So with all these precious inputs I got myself to work again on the essay and I did the following the best I was able to. After correcting mistakes and inaccuracies, following my tutor’s suggestions I tried to distantiate myself from my primary sources – in this case the substantial absence of secondary sources gives me a certain responsibility to at least attempt a critical appraisal. I also eliminated parts that did not seem really necessary or that were somehow reiterations of concepts already expressed at some other point. I rearranged some of the paragraphs in order to chain ideas in a more consequential way, to enhance cohesion and readability of the text. And lastly I rechecked the meanings of the words I was not totally sure of and my grammar, being English a second language for me. For this Exercise I have chosen to analyse a fashion image from the Gucci Live Autumn/Winter 2017 Ready-to-Wear Collection, at : http://www.vogue.com/fashion-shows/fall-2017-ready-to-wear/gucci/slideshow/collection#3. Along the main picture I have also included images of two details of the same look from the main page. I think that the outfit selected, with its luxuriant, superabundant maximalism, can represent well some of the latest trends in fashion today. Gucci’s creative director, Michele Alessandro, presents for the first time a combined men/women collection, and this also is an interesting innovative element of the show: male and female models walk the runway together, and so the accent seems to be on an easy fluidity between genders which can freely exchange their outfits and implicitly their roles. The overall first impression I get from this catwalk image is of extreme exuberance and eclecticism, great freedom in assembling disparate elements which look assorted at random, a general feeling of casual easy street style. 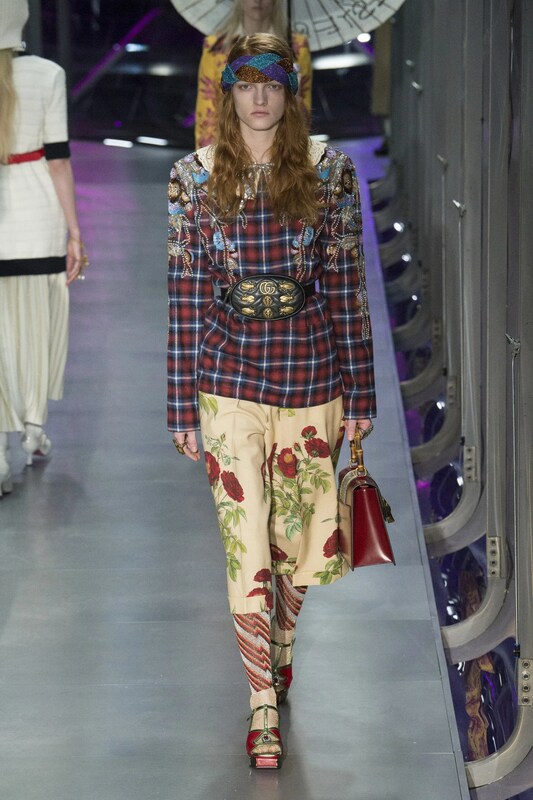 An immediate association has been with the Seventies’ label Laura Ashley with its romantic floral frocks and 19th-century rural feel, but this is just one of the many possible inspirations that went in this super-abundant collection, aptly named “The Alchemist’s Garden” by Gucci’s creative director. But contrasting with the richness of decoration, if I now focus my attention on the silhouette I see naturally flowing lines not too tight to the body, moving swiftly around it without excess. There is an overall fluidity, underlined by the mid-calf length of the culottes which gently flare out. Also the platform sandals have a mid heel and contribute to a natural walk. The blouse just rests on the hips, not too fitted either, and even if the waist is belted the elongated silhouette is not interrupted. Shoulders are moderately wide and padded, soft and rounded, sleeves are long and straight. Every element emanates easiness and comfort, the overall shape is clean and lean. Closely associated with the fluid silhouette are the moderate volumes built on the body by the light fabrics used for both the blouse and the culottes. All the attention is on the exquisitely ornamented details of this outfit and the gentle movement of garments is an invitation to slowly explore them. There is no excess fabric used here to form gathers or pleats, only that necessary to create the natural folds on the garments which accompany with grace the body while it moves and have a delicate drape. In order to analyze the outfit in terms of colour, I have reduced the chromatic palette to sixteen hues using PaintShopPro and what I got is a definitely autumnal/winter palette of muted, toned-down, generally low-key colours on the warm side of the spectrum which create a traditional, understated effect. The brightest colour, a nuance of Burgundy red, stands out pleasantly. 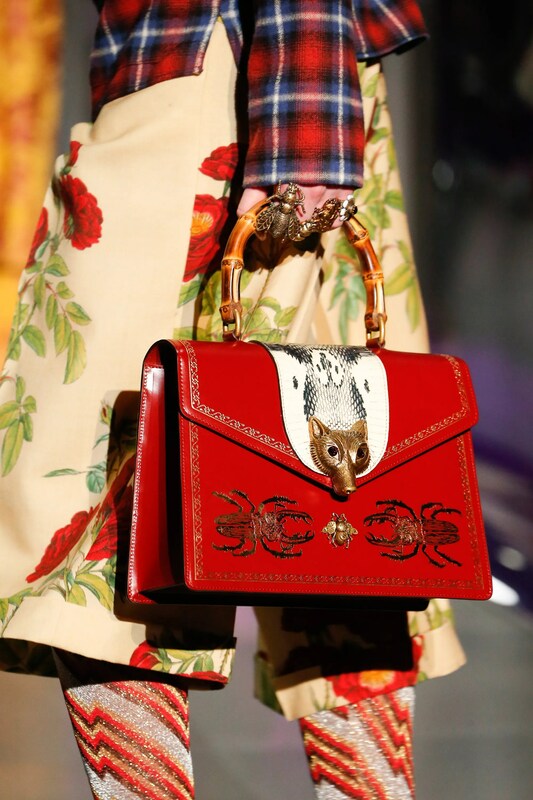 But of course what really stands out in this Gucci’s look is the outstanding combination of patterns and decorative details which have many references and inspirations in an eccentric ‘more is better’ mood. The mix of possible cultural and historical influences appears so varied and rich that in many cases it’s only possible to make guesses, as if in a serious but free and playful game. I have already mentioned Laura Ashley’s rustic floral frocks of the Seventies, but the roses printed on the culottes can also be a remembrance of vintage tapestries or refer back to one of many historic Gucci’s botanical prints, chosen from the fashion house rich scarf archive, or possibly be a contamination of all these different styles and still others. And the roses are interestingly combined with the Scottish tartan pattern of the blouse, further ornamented with delicate embroideries of floral twigs, or else with the Seventies zigzag stripes of the lurex stockings. But the mix and accumulation of decorative details of this outfit goes well beyond patterns and prints: there is the glitter braided sweatband in Disco style, the long romantic haircut of the model girl (or is she a boy? ), the wide flat collar (a 19th century accent perhaps?) with its sparkling little bow. And then of course the accessories: the animal studs leather belt bag with the double GG logo, the iconic bamboo handle hand bag with the fox head broche and the Egyptian beetle print, the gigantic bee and moth fashion rings, the Oriental/Forties inspired platform sandals. Flowers, insects, Egyptian symbols, oriental influences, men’s wear, Forties, Seventies, old wallpapers, Eighties disco dance, romantic British gardens … it’s an incredible mix and match of elements and styles. The message seems to be that everything can be kept and used, fashion is a free game that is serious and playful at the same time, and the result is a bold, easy, eccentric street style which everyone can adopt. There is also a vintage aesthetic but interpreted in a contemporary way, without exclusion of materials and fabrics, for an opulent but also pop effect. From the commercial point of view I think that a collection like this is very savvy: everybody can find something that he or she (does it matter? all is exchangeable) likes, maybe only a little accessory or a detail, and such an outfit is an implicit invitation to keep layering garments and adding bags, jewellery, scarves galore. If I like it? I don’t know really and I don’t think this is too much important either. What I do admire is the incredible craft that goes into all these beautiful details, the ability to give life to such a complex vision and the rich cultural background that makes a collection like this possible. My instinct here is to learn the mix-and-match lesson, go back to my wardrobe and see what I can make out of it using the same free spirit!